The impending shutdown of a nuclear reactor in Chalk River, Ontario, is posing some serious challenges for Canadian researchers who depend on this facility’s unique capabilities. A coalition, led by the University of Saskatchewan and McMaster University, has been lobbying the federal government to provide a decade’s worth of funding that would ensure these scientists and engineers gain an alternative access to a scarce commodity: beams of the subatomic particles known as neutrons, which emerge from the heart of a reactor. Some of the support requested would contribute to the maintenance and development of foreign facilities that generate neutron beams for research, so that Canadians would have ready access to these sites. Some of the money would also go to operations within Canada, particularly the upgrading of a reactor at McMaster’s campus in Hamilton. The proposal, dubbed the Canadian Neutron Initiative (CNI), has been recommended for funding by the House of Commons Standing Committee on Finance in the next federal budget. That recommendation capped one of the CNI’s busiest years since it was formed in 2015, following news that the Chalk River reactor – known officially as the National Research Universal (NRU) – would close in 2018. The NRU has been in service since 1957, making it the world’s oldest large facility still in operation. And while it has experienced mishaps and breakdowns during its 61 years, it remains safe and serviceable. It also costs Atomic Energy of Canada upward of $100 million a year to maintain, which prompted the decision to shut it down in March of this year. A warning sign is posted at the AECL plant in Chalk River in 2007. Photo courtesy of Canadian Press/Fred Chartrand. By comparison, the CNI is asking the federal government for $24 million over the next three years, and $19 million annually from 2021 to 2029. According to the CNI’s pre-budget submission, Those funds would shore up the activities of more than 800 investigators across the country whose work depends on particles emitted by powerful nuclear reactions, specifically a procedure called neutron scattering. 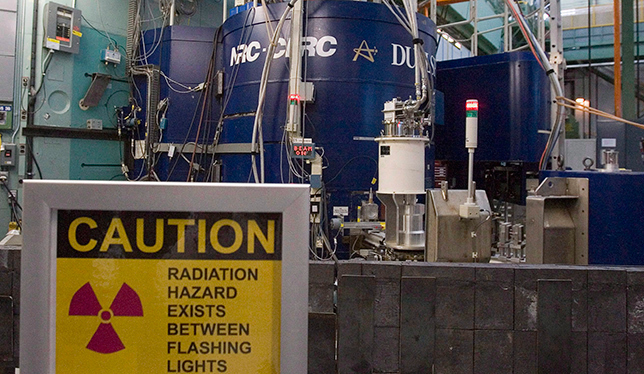 The NRU is among a handful of major sites around the world where the analytical technique of neutron scattering can be conducted. Because neutrons have no electrical charge, they can pass through dense materials and emerge to create detailed pictures of the interior structure. Such visualization has become an invaluable industrial tool for verifying the quality of crucial metal components in such products as turbine jet engine fan blades. The technique has also helped to confirm the cause of structural failure after major accidents, like the destruction of the space shuttle Challenger in 1986. Neutron scattering also features largely in a range of purely scientific studies. The field was pioneered in the 1950s and ’60s at the NRU by scientists such as Bertram Brockhouse, whose work there earned him the Nobel Prize in physics. Chalk River subsequently became home to the Canadian Neutron Beam Centre, which supports a highly specialized, local expertise that is essential to setting up experiments at the reactor. Longtime observers worry that the end of the NRU will lead these experts to seek work outside of Canada, or to retire from the field altogether. Dr. Gaulin is a former president of the Canadian Institute for Neutron Scattering, a national group of volunteers representing the community of neutron beam users. When the retirement date for the NRU was made official in 2015, this group looked for backing from universities to frame an action plan that could be presented to the government, along with a request for funding. The University of Saskatchewan took the lead on the effort, which became the CNI. By last summer, members of the CNI were talking with the Natural Sciences and Engineering Research Council; the Canada Foundation for Innovation; the National Research Council; Innovation, Science and Economic Development Canada; and Minister of Science Kirsty Duncan about the importance of neutron scattering and the future of this field in Canada without the NRU. He notes that over the last couple of decades, while Canada spent little more than the minimum for the NRU to age gracefully, government-backed institutions in Europe and Asia invested upwards of $8 billion to expand the potential of neutron scattering. The need for these expensive, long-term commitments is why there are so few facilities available and why much of the work calls for intricate international collaboration. Since 2003, for example, the Canada Foundation for Innovation has supported one such arrangement at the Oak Ridge National Laboratory in Tennessee, where Canadian investigators like Dr. Gaulin have been able to gain access to the Spallation Neutron Source (SNS), a sophisticated particle accelerator that can generate neutron beams without the need for a nuclear reactor. The Oak Ridge partnership also concludes in 2018, but Brock University physicist Thad Harroun, another core member of the CNI, regards this as a model of how Canada should proceed in the U.S. and elsewhere. As with other areas of “big science” – large-scale international initiatives such as telescopes built on remote mountaintops or particle accelerators the size of a small city – the costs of building a new reactor or other neutron beam source are high, both in terms of time and money. Canada may eventually find itself willing to undertake such a challenge on its own, but the CNI’s concern is that by that point, Canadian expertise and talent will have been lost – another reason the CNI advocates for partnering with places where neutron scattering remains active and well-funded. This concern isn’t a new one, Dr. Harroun adds. In late 1990s, as the eventual retirement of the NRU was being contemplated, the discussion “was along the lines of ‘Let’s get ready for a replacement reactor,’” he says. However, the NRU’s remarkable longevity made it possible to keep postponing any concrete measure. “A replacement source, a domestic source in Canada, is still a long way off. There haven’t been any champions for that cause in quite a while,” Dr. Harroun says. Instead, Canadian researchers like Dr, Gaulin, Dr. Root and several others, travelled to Sweden in November to set the stage for a partnership with a new spallation source being constructed there. That facility, which is about a decade away from completion, promises to set the bar for this science even higher. Canada, with a long history of experience to contribute, has been invited to join this new enterprise. With the recommendation of support in the upcoming federal budget, the CNI could be primed to act on this invitation. While much of the requested federal funding would go to offshore interests where Canadians can find neutron beams, some will go to the reactor at McMaster. Although its power level is much lower than the Chalk River reactor, which limits the kind of neutron scattering that can be done there, the CNI would help to maximize its power yield pay for new equipment to increase its capacity for neutron scattering work. A portion of the CNI’s proposed budget would also go toward a national centre where the skilled technical staff from the NRU would be able to continue their careers, working with scientists and students in Canada as well as their counterparts around the world. A location for this centre has yet to be decided.